A dry spice-rubbed steak grilled to perfection and chopped with sweet and tangy marinated pepper strips. Grind dry spices with a mortar and pestle until finely ground. Apply the dry spice rub to the steaks and lightly drizzle with oil before grilling. Grill steaks over medium-high heat until steaks reach desired doneness. In a saucepan over medium heat, sauté onions until they start to soften. Add minced garlic and pepper strips to the onions and continue to sauté for 2 minutes. 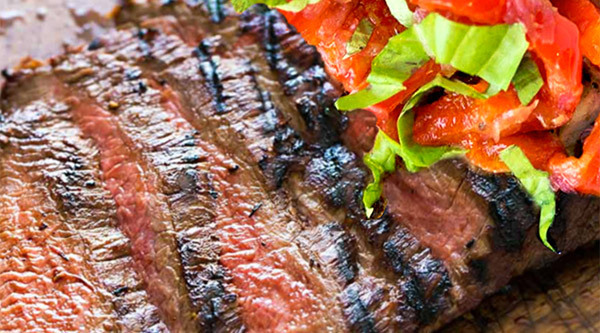 Cover grilled steaks with sautéed onions and peppers, finish with julienne-cut sliced fresh basil.